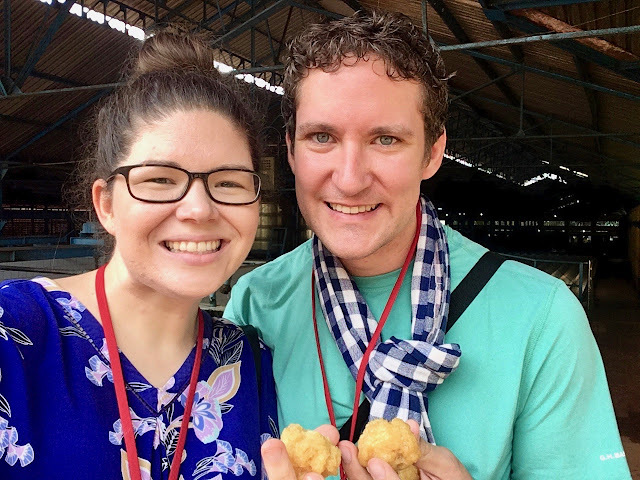 A few weeks ago, during a break in classes, we got outside the city to explore the province of Kampong Cham (about two and a half hours outside of Phnom Penh). 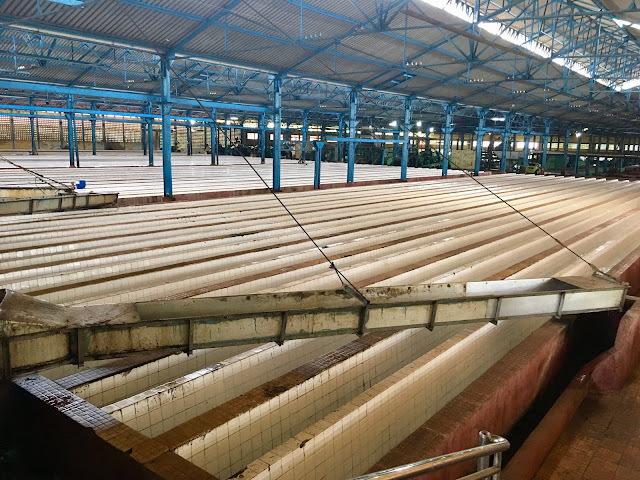 One of our favorite things about the trip was getting a chance to learn about and explore the rubber plantations and factories there. 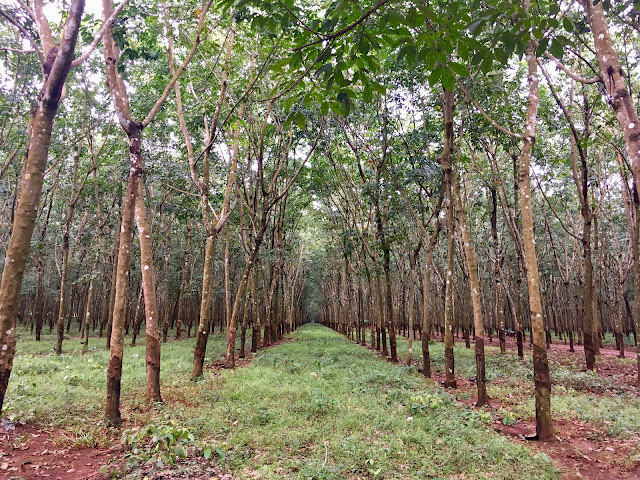 The rows and rows of rubber trees were sights for sore eyes. 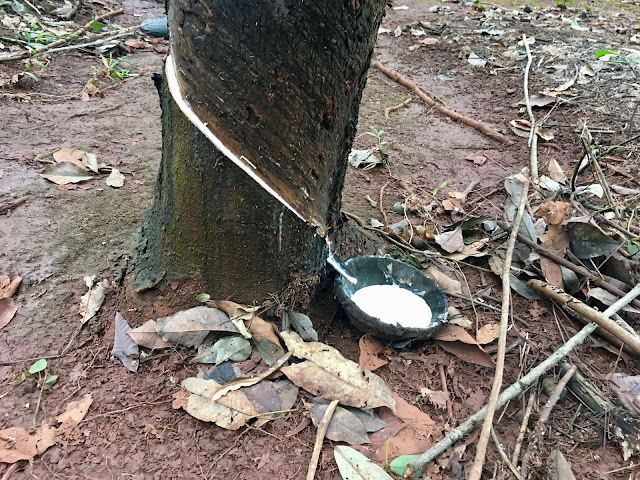 A section of bark is scraped away, and the sap trickles down into the bowls. Workers were out walking between the trees collecting the sap. 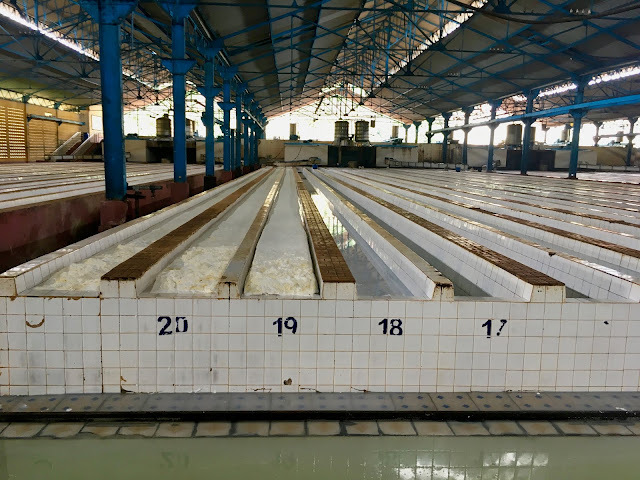 From there we went to a rubber factory. We had read they allowed visitors to come tour the facility, but we didn't really know how to get the ball rolling with that. 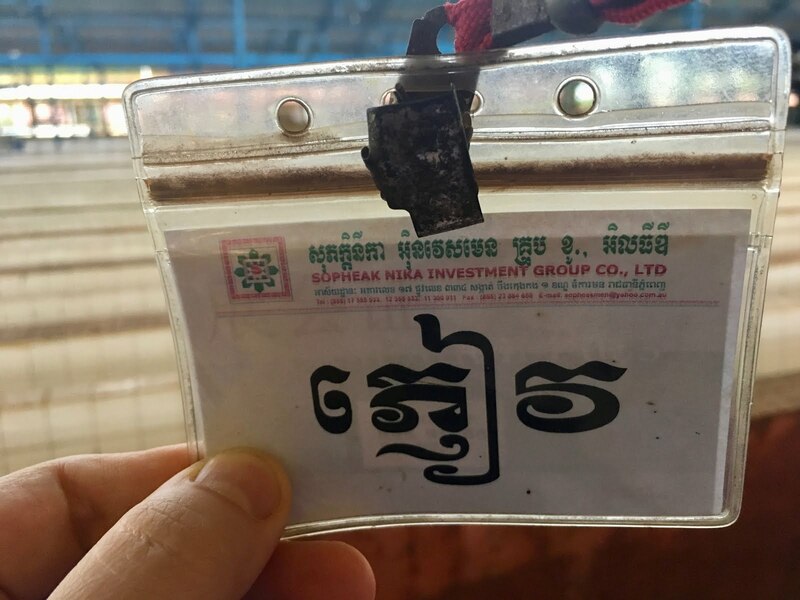 We practiced a speech in Khmer, drove up to the gate, and got the guard's attention while fully expecting him to tell us we were crazy and that we could not go inside. Instead, before we could get a word out, he waved us in the gate, pointed to a parking space and got us signed in. The "tour" consisted of giving us badges that said "guest" and pointing us in the direction of the factory. 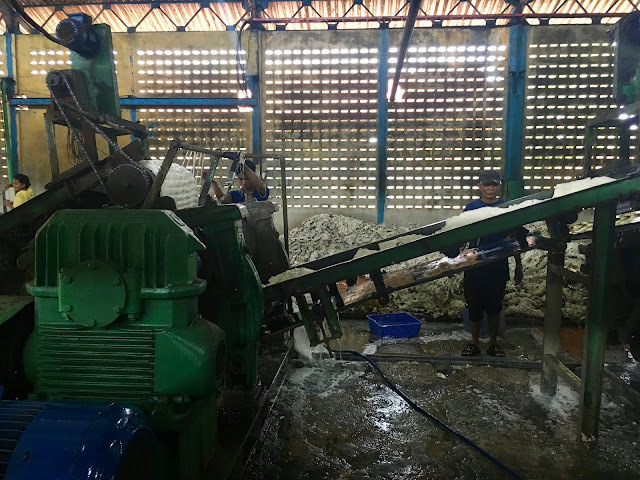 Thankfully with a bit of Khmer, some outgoing factory workers and a bit of imagination, we learned quite a bit about the process of making rubber. Tanks of sap from the rubber trees are hauled in on trucks and dumped into these shoots. This part was pretty stinky! 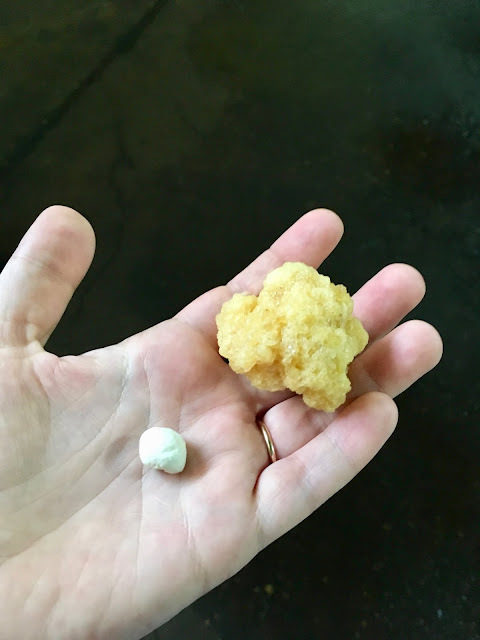 Here it gets washed and squished. Next it gets baked in giant ovens. A bit of rubber before and after it gets baked. The color and texture changes quite a bit. 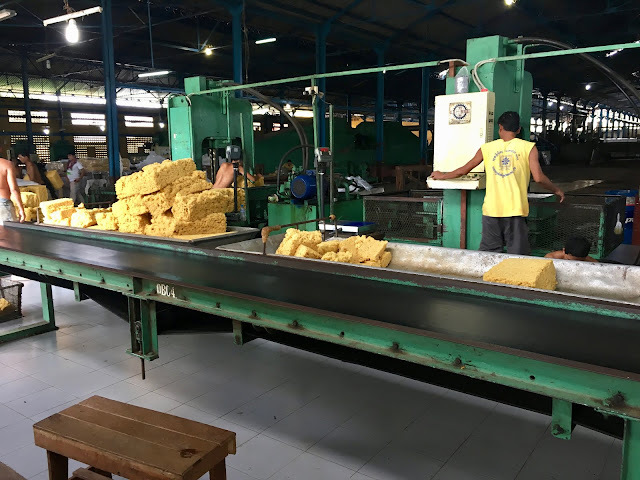 Finally the rubber gets weighed and compressed into large bricks. These were then picked up, bagged, and stacked in crates to be exported. I asked the small, older man who was picking them up without much effort how much they weighed—about 75 pounds each it turned out! 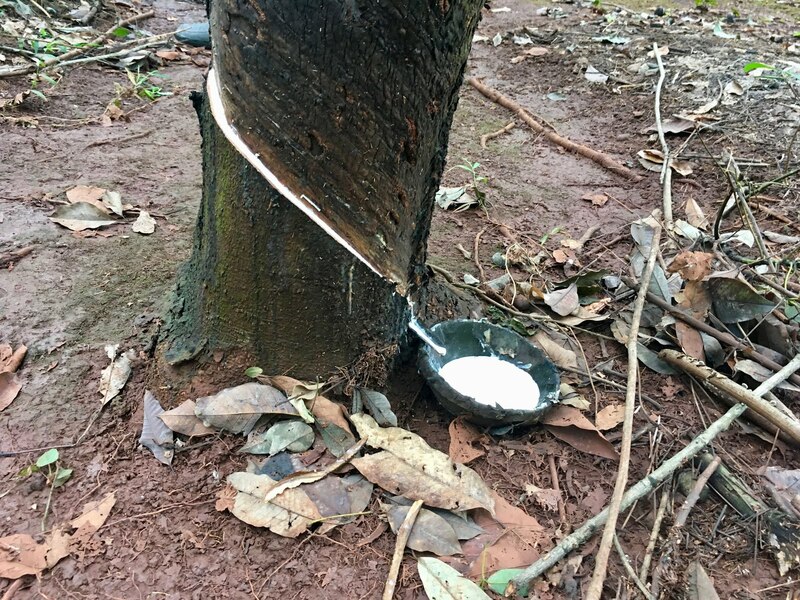 We were told that Cambodia does not currently have facilities to further process the rubber. So, it gets exported out as raw rubber and imported back in as tires, erasers, shoes, etc. While at first we felt a bit awkward walking around the facility while everyone was working, we had a lot of fun learning and exploring.